Jake is a fun dog who loves learning new things. He's already a rock star at agility training and is always up for a new adventure. Although Jake is shy and fearful with strangers, once he trusts you he is eager to please and will be your best friend. He adores the people he knows and is very loyal. He's also incredibly smart and loves other dogs at the Sanctuary. 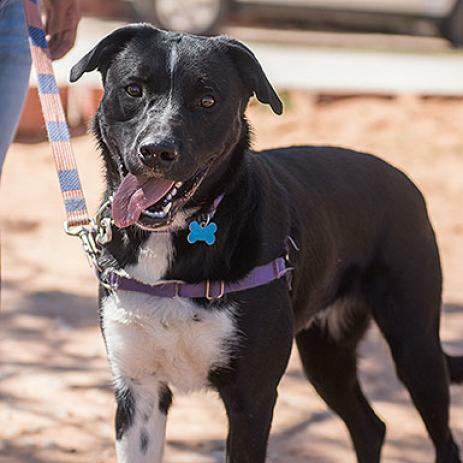 He would love a dog friend in a home, but he'll needs one who will play with him and appreciate his high energy play style. Jake was born in 2017 and is looking for an active home with an understanding person or family. It takes some time to build relationships with him, so a quiet home that does not have a lot of guests would be best. When guests do come over, Jake should be separated if the new person has not had a chance to build a relationship with him first. At the Sanctuary, Jake is working on meeting new people and maintaining those relationships. He's doing well and has already made many friends. He is also working on doing trades for his food bowl and other high value objects to prevent food guarding. If you take the time to get to know Jake, fun and adventure await.